A good mud mixing and additive system should be a jet-shear mud mixing system, it must has three functions, shearing, jet mixing and drilling fluids additive. GN design and produce such multiple function system. GN mud mixing and additive system can be mounted on a separate skid then connected with a mud mixing tank, or they can be mounted on the skid of the tank. The latter way is a compact structure of mud mixing unit, and the former way can be more flexible to move the mud mixing unit from one place to another. But you do not have to move it all the time, the mud mixing pipelines which is controlled by butterfly valves can reach this target, too. Venturi hopper with a mixing pump is the most simple way for the mud mixing unit. Centrifugal pump can be replaced by shearing pump, then you call it jet-shear mud mixing system. What is drilling mud additives? Drilling fluid additives are specialty products that serve a specific need – and Halliburton and Baroid are known for high-quality additives that deliver the consistent performance mandated by environmental regulations. Our commitment to research and development ensures that our products and processes reflect the latest advancements in fluid additive technology. Jet shear mud mixing systems are designed to use shear pump to efficiently mix solids with liquids. 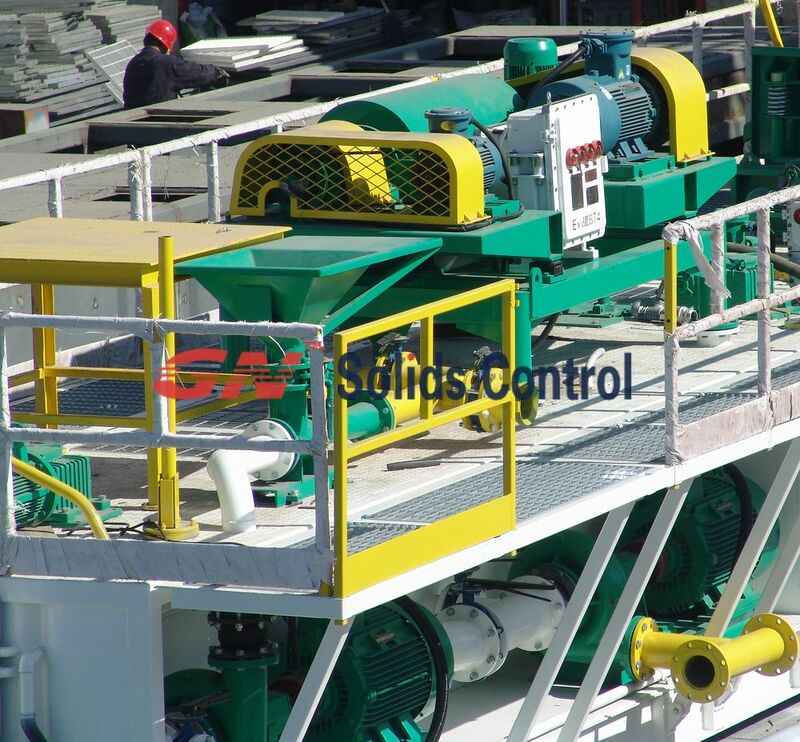 Jet shear systems ensure efficient and mixing of soluble polymers and bentonite used in water-based drilling fluids, therefore eliminating “fish eyes”. Drilling fluid yield and gel strength properties are instantly obtained with hydraulic shearing of bentonite or organophilic clays. The addition of liquid additives is made easy with the incorporation of an injection port into the jet pump. This port is capable of handling liquid additives such as; lubricants, polyacrylamides, and oil-wetting emulsifiers. By incorporating an in-line mixer, the operator is given the choice of imparting low shear into the drilling mud. When the appropriate level of mixing is imparted into the drilling mud, polymers are efficiently used, therefore lowering additive costs. We can design customized mud mixing system for client’s multiple requirement, such as cross, mud hopper type, electric motor, mixing pump type, skid, mud hopper dimension, mixing speed and drilling mud density, viscosity, etc.. Founded in 1919, Halliburton is one of the world’s largest providers of products and services to the energy industry. With nearly 60,000 employees in approximately 80 countries, the company serves the upstream oil and gas industry throughout the lifecycle of the reservoir – from locating hydrocarbons and managing geological data, to drilling and formation evaluation, well construction and completion, and optimizing production through the life of the field.